Just look at this amazing painting. Monet is one of my favourite painters, his work is free, yet controlled, it is merely translating the shapes of colours you can see to a canvas, yet it is so beautifully done, and provokes such tranquillity. 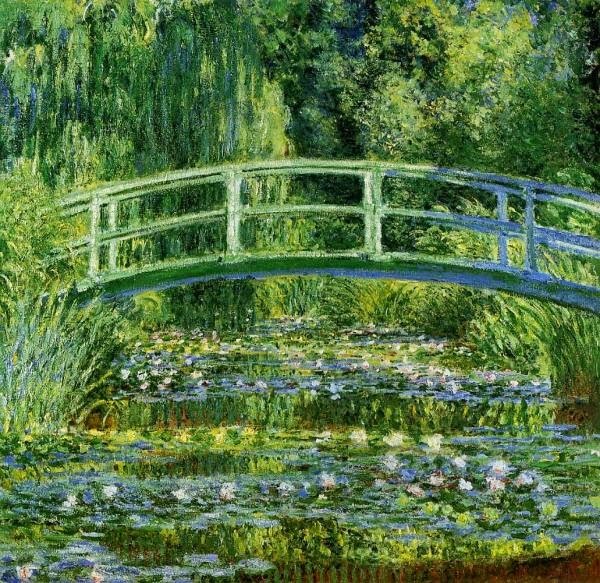 The Water-Lily Pond, and all other depictions of Monet's very own water garden that he had created from a plot of land across the road from him when he lived in Giverny, are some of the most recognisable paintings, making them very well known, and an obvious starting point for my project. Although not my favourite Monet painting (might I suggest Wild Poppies, 1873 or Ice Flores on the Seine, 1867 or even the wonderfully dark portrait, The Woman in A Green Dress, 1866), it is so well known that I instinctively went for it. The design for this was tricky, as his work is peaceful as a whole, but when you really look at it you can see a lot more movement in the brush strokes. I changed the finally look a lot, and it is really nothing like the design now, but I am pleased with the outcome never the less. I had wanted to play around with white eyeliner, as Monet was of course interested in the effect light had on objects and on colour. But I realised it wouldn't work, this painting has no need for a white line, it just doesn't contain anything that would justify it. It made it look too harsh. Unfortunately, today I do not have a picture of my design, but I would usually place one here, hopefully I can get one up soon. So on to the make up! I started off with a lime green base, and a darker green running all the way across the eye socket I ran a purple-y blue along my lower lash line and a bit on my outer corner, and I lined my lower waterline with a white pencil. I also put a lighter colour on the tear duct. After I had a good base, I went on to replicate the flowers you can see in many of the waterlily paintings. When you actually look at them, they are simply blobs, with a some added colour on them. I used a white gel liner as the base, and added a small amount of purple, and orange, and some pink eye shadows. I decided because the painting is based on nature, I didn't want to use mascara, because it makes it more natural, and more like the painting.